Yesterday afternoon, I went out for my nest check and to my surprise, there was one lone baby standing on the edge of the nest. It reminded me of when I stood on the HI-DIVE for the first time... thinking... NO WAY AM I JUMPING MAN. In a flash he took off and landed in the grass. 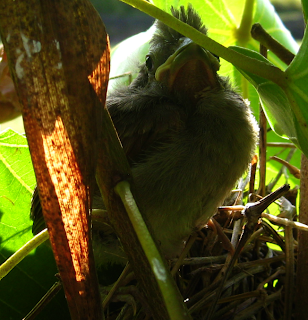 I heard the chirping of the others, and the parents showed up right away. 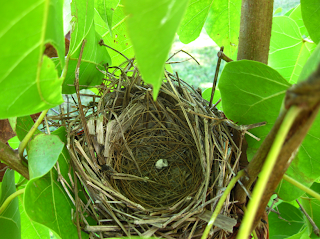 I felt as though this last one out of the nest was going to be in trouble. I just imagined it being told... "We told you to stay put until we came back for you." I felt I needed to explain that it was my fault. I waited around about 100 feet from the baby until the parents rounded up all three and took them deep into the banana patch. So that's it... 9 days after hatching and they are out and about... feathered and flying. 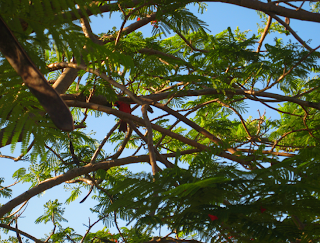 I did not see them today, but saw mom and dad flying in and out of a Christmasberry tree all day. There were several chicks in there chirping, but I did not investigate. Thought it best to give them their space. I'm sure they will show up on the rock off the lanai soon. 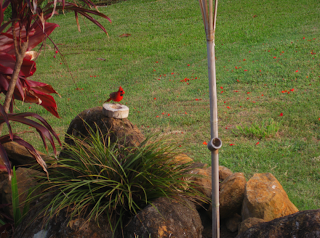 Adult cardinals always bring teenagers there when teaching them how to find food. Not that there is much to finding it... when it's served up daily at 7:oo AM and 5:00PM. We'll keep you posted if and when they do show up. This was the only pic I got as my camera battery died the minute I snapped this. 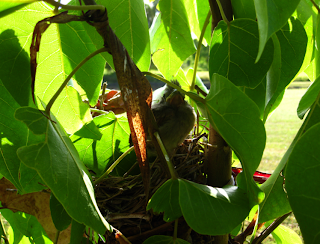 Just to make sure they did not return to the nest, which I do not think they do... I went back out this morning. They left it pretty clean. I think we can give them back their security deposit. Dad filling his cheeks on the rock off the lanai... hopefully to take it back to the family. This is the guy that see's me walk outside and he follows me from tree to tree. 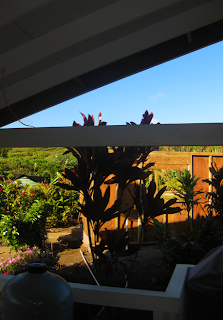 He's even come right onto the lanai at times... singing for food. Here he is at 7:00 yesterday morning... singing for his breakfast... looking in the window ... tilting his head back and forth. His next stop was right down to the railing. I'm such a sucker. At least these won't eat us out of house and mac nut home. Only 9 days... really amazing right? 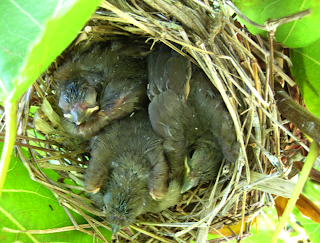 still waiting to see them out and about... but mom and dad sure are busy... and I do hear them chirping away in the brush. A SUBWAY?! ACK...The horror... But I do remember a time when I loved the subway... especially in Chicago. It's a bit more civilized there. Hope you had a good time off. That little guy has the best nesthead hairdo! Ok....that is hilarious. I am cracking up....I think we can give them back their security deposit. HAHAHAHAHA!! !